The true story of defiant boxer and car crash victim Vinny Pazienza. This is Teller and Eckhart's film, and the bromance that develops between the pair is endearing and touching, but never sentimental. Two men broken in very different ways, Pazienza and Rooney bring out the best in each other. 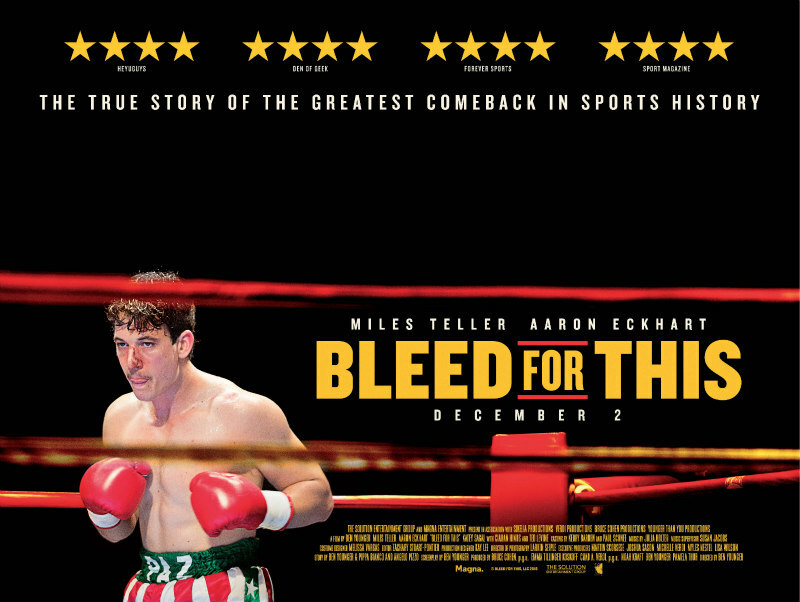 When it comes to inspiring filmmakers with dramatic real life stories, boxing surely has all other sports licked. Just when you think you've seen every possible tale of a pugilist defying the odds to conquer his profession, along comes another larger than life yarn. 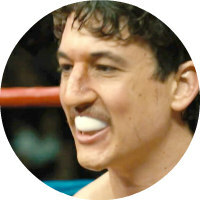 No doubt fans of the sport will know the story of Vinny Pazienza, portrayed in director Ben Younger's Bleed for This by Miles Teller, but it was fresh to my eyes. Younger's film begins in 1988, with Pazienza losing his third fight in a row. Despite the advice of his promoter (Ted Levine), the fighter refuses to retire, hiring disgraced trainer Kevin Rooney (Aaron Eckhart), formerly of Mike Tyson's corner before losing his licence due to a drink driving incident. Rooney decides Pazienza should move up a couple of weight classes, a decision which pays off when the boxer claims the World Junior Middleweight title in a 1991 fight against Frenchman Gilbert Dele. Pazienza's newfound glory is tragically cut short when a car crash leaves him with a broken neck. Forced to wear a cumbersome metal brace, screwed into his head at four points, Pazienza defies the advice of his doctors and begins to secretly train in his basement with Rooney. An unlikely comeback begins. In Younger's hands, Pazienza's story is an easy watch, perhaps a little too easy. Save for a gruelling scene in which the stubborn boxer refuses a sedative while having his brace unscrewed from his head, the film never quite communicates the psychological toil the scenario must surely have had on the athlete. Teller's Pazienza appears to be suffering no more than a mere inconvenience, as though his arm were in a sling rather than his head in a brace. Yet this makes the boxer easy to warm to, and his spirit is undeniable. Living at home with his Italian-American family, he's a charmingly humble figure whose biggest worry is upsetting his constantly worried mother (Katey Sagal), whose fear of an injury to her son meant she could never watch his fights, instead preying to an elaborate altar of Catholic paraphernalia during his bouts. Sagal is largely wasted, reduced to a stock Italian-American archetype, an accusation that can also be levelled at Pazienza's father, played as a cartoonish figure by Ciaran Hinds. But this is Teller and Eckhart's film, and the bromance that develops between the pair is endearing and touching, but never sentimental. Two men broken in very different ways, Pazienza and Rooney bring out the best in each other. If some of the events portrayed seem too dramatic to swallow, stick around for the end credits, accompanied by real life footage from the remarkable life of Pazienza, allaying any doubts we may have had concerning the veracity of Younger's take on his story. 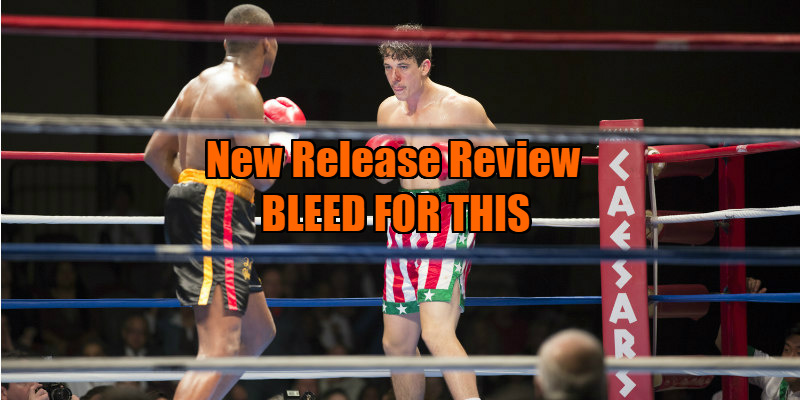 Bleed for This is in cinemas now.